UNB’s faculty of engineering hosted its first faculty-wide Engineering Design Symposium on April 8 in Fredericton. Over 540 people -- engineering students, faculty, staff and industry partners -- packed the Fredericton Convention Centre to view the design work of final-year engineering students. Sporting their new iron rings, 200 students from chemical, civil, electrical & computer, geological, geomatics, mechanical, software engineering and UNB’s Technology Management and Entrepreneurship program presented their designs to fellow students, potential employers and industry and community partners. Many student teams collaborated with government, industry and community groups to tackle real-world problems. Geodesy and geomatics engineering student Craig Murray developed a new mobile application for reporting accident location via a Global Navigation Satellite System and cell-phone user interface. His design will improve upon the current manual (i.e. hand written) method for reporting motor vehicle accidents in New Brunswick. "The first annual engineering design symposium was a great success," said Dr. Michel Couturier, NSERC-UNB chair for collaborative engineering design education. "Over 240 senior engineering students from seven disciplines presented their design work to an audience of nearly 300 people." "The majority of the projects were sponsored by local companies and governments. I am impressed by the work that students have invested in their projects and the relationships that students have formed with industry partners." The engineering designs aren’t limited to the technical fields. Many of the innovations serve a social purpose. A team of mechanical engineering students partnered up with UNB-startup Oasis Farmery to design a sustainable low energy greenhouse for aquaponics. 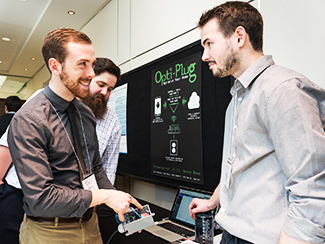 An award-winning electrical and computer engineering team created a prototype of a Smart Electrical Plug or “Opti-Plug” that allows homeowners to actively monitor the power consumption of any device connected to one of their Opti-plugs through a smartphone app. The device enables homeowners to determine if electricity savings can be achieved through simple changes in their usage habits, and also allows homeowners to switch appliances on and off with a smartphone. One team is even improving your morning pancakes. Students from UNB’s Technology Management and Entrepreneurship program are revolutionizing your breakfast with a fully automated counter-top pancake-making appliance. “Tempo”, which won the top prize in the 2015 Student Pitch Competition, hosted by the J. Herbert Smith Centre for Technology Management and Entrepreneurship (TME), grabbed first place in the TME category. Team members Ryan MacDonald, Nicole Bendrich, Sophie Daigle and Katie Wilson produced an intelligent mobile application that integrates music and workout intensity for an improved exercise experience.